In an effort to continue my restful weekend we did a really easy Father's day menu. We went to the local Canadian Superstore and picked up homemade fresh salsa, spicy hummus (see how tired I was to not even make my own hummus? ), some olives, and corn on the cob. It was so incredibly good and satisfying. My husband commented that meat eaters don't know what they are missing ... and then he said, "I guess they eat this stuff too." I think the difference is that they don't know how satisfying a meal can be without meat. 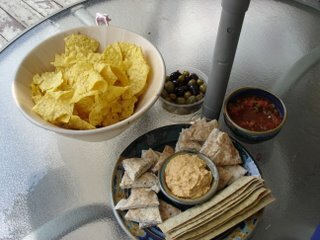 This afternoon I was actually inspired enough to make my own hummus. I made the canelli bean and yam hummus from Dreena's Vive le Vegan. It was as good as everybody was saying and I didn't even have the hot chipotle sauce, just normal tabasco sauce! "... they don't know how satisfying a meal can be without meat." AMEN! :o) Nice stuff, your post and the food! I am laughing now because the hummus (I honestly) made and the one I bought look almost the same. 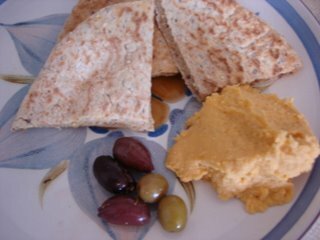 It looks as though I am trying to pass off store bought hummus as my own! LOL!